The first image of a black hole is widely expected to be released Wednesday by the Event Horizon Telescope — likely the most hyped moment of the week aside from the possible arrival of the Mueller report. The image would be a groundbreaking achievement for the two-year-old international observatory. The hundreds of millions of black holes that pepper the universe shape our very existence, which we know thanks to recent research. Discoveries made in the last three years revealed that when black holes collide they can send literal shockwaves across galaxies, moving every piece of matter that surrounds us. Yet stargazers have pondered black holes for more than 200 years — and spent millions of dollars on studying them — without actually seeing one. Black holes even mystified the illuminated mind of Albert Einstein, whose theory of general relativity and its many offshoots hinged on the idea of areas with massive amounts of gravity. There will only be one time in the history of our planet where we will see an image of a black hole for the first time. Dijkgraaf said that like our atoms, black holes may represent a fundamental piece of nature, and a direct observation of one will only serve to expand how our world came to be. An “event horizon” refers to a place of no return — where the gravitational tug of a supermassive object is so immense that nothing can escape it. Scientists have witnessed hints of these events since at least 1990, typically whenever a star ventures too close to a black hole. But a direct observation of the silhouette of an event horizon — and by extension, a black hole — has remained elusive. “There will only be one time in the history of our planet where we will see an image of a black hole for the first time,” Dijkgraaf said. “The discovery would be on par with the direct detection of gravitational waves three years ago,” which won the 2017 Nobel Prize in Physics. So, in preparation of what might be a momentous day, here’s what you need to know about the announcement. How did we discover black holes? Black holes unite some of the most buzzworthy topics in physics: Einstein’s theory of general relativity, quantum mechanics, the evolution of the universe (cosmology) and even religion. The idea of a black hole was first conceived by a British, astronomy-minded clergyman named John Michell in the late 1700s. While mulling the discovery of stars that exist in binary (pairs) or triplets, Michell theorized that the gravitational forces of one star might affect light beaming from another. This is not an actual image of a black hole. 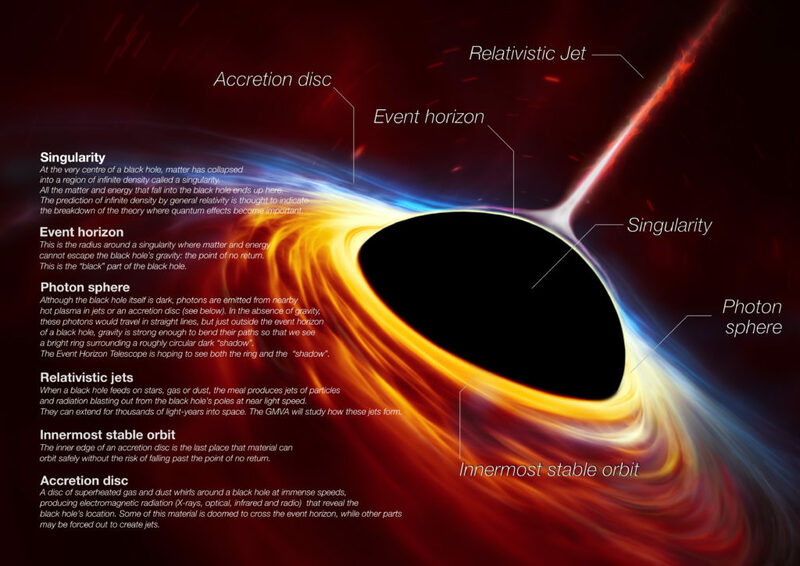 This artist’s impression depicts a rapidly spinning supermassive black hole surrounded by an accretion disc. His thoughts extended the proposition to the extreme — a star so massive with so much gravitational pull that no light could escape, which he dubbed a “dark star.” French mathematician Pierre-Simon Laplace would arrive at the same theoretical conclusion a few years later; the pair is often credited with origin of the concept. Today, we know that black holes shape our universe. Recent research points to black holes sitting at the center of almost all large galaxies, including our very own Milky Way. Dijkgraaf said this evidence — and much more — points to black holes being essential to the structure of galaxies, if not the universe itself. What is the Event Horizon Telescope and why do we need it? Scientists at eight radio telescopes observatories — stretching from Hawaii to Greenland to the French Alps to Antarctica — captured images of one black hole in our Milky Way,known as Sagittarius A*, and another in a nearby galaxy called M87, over the course of a week in April 2017. (The PBS NewsHour visited one of these telescopes in Chile when the project was still under discussion). By working together, the scientists created, in essence, a planet-sized telescope built to scan massive parts of the skies. 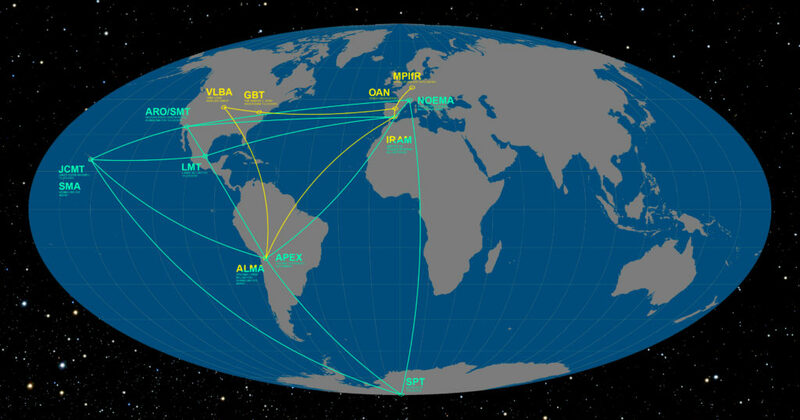 To cancel out the unwanted background static created by taking snapshots across so many different points across the world, the Event Horizon Telescope partnered with the Global mm-VLBI Array. This second set of space observatories helped to synchronize the measurements from the Event Horizon Telescope and sharpen the image. Together, the projects can capture a high-resolution picture of deep space — or at least, that’s the hope. Dijkgraaf said the quest for viewing a black hole is extremely exciting because our human instincts push us to look beyond the limits of our understanding. A black hole, which is also known as gravitational singularity, represents a place where the laws of physics begin to self-destruct, he said. “It is a point where both our knowledge, but also our ignorance come together,” Dijkgraaf said. Peering at a black hole may reveal the place where gravity and quantum mechanics meet or how the universe might end. He described this type of international collaboration as a worldwide brain, and added that such projects show the incredible importance of countries working together. 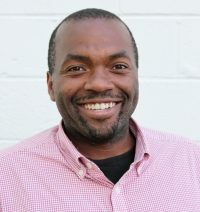 “We see that large international collaborations are in some sense more stable because they cannot be cut off at the whim of one government or no one research institute. They have a certain inertia,” Dijkgraaf said. “I find it very beautiful that we had to get together as a global scientific community in order to do this.